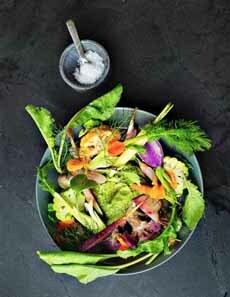 Celebrate spring with a beautiful bowl of crudités, artistically arrayed. Stroll down the produce aisle of your best market and select the most appealing veggies, looking for different colors and textures. Arrange them on a beautiful plate or in a shallow bowl, with a bowl of green hummus in the center (photo #1). MINI TIP: If you have leftovers, you can steam them or turn them into a salad. Or, use them to garnish grilled fish. Buy it or make it. We recently reviewed Lantana Hummus, which has both edamame and cucumber varieties that are pale green. Or, go for a deeper green. Blend avocado, green peas, or a handful of green herbs into hummus. We adapted this from-scratch recipe from Cookie & Kate. It’s a brighter green (photo #4). More options: bright green olives like castelvetrano, sorrel, watercress. A beautifully arranged bowl of crudités from Crawford And Son restaurant in Raleigh, North Carolina. The dip, green hummus, is in a small howl in the center of the dish. 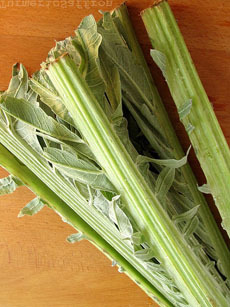 It may look like celery, but cardoons are a spring vegetable closely related to artichokes. Peel away the outer layer, slice, and add to the crudités plate (photo courtesy Turmeric & Saffron | Blogspot). Most people wouldn’t think to put leafy greens on a crudités plate. 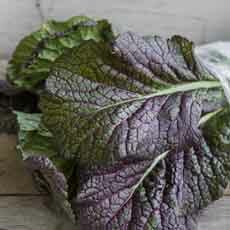 But while they’re not as easy to dip as a hard vegetable, they’re refreshing and, in the case of these mustard greens, nicely spicy (photo courtesy Good Eggs). 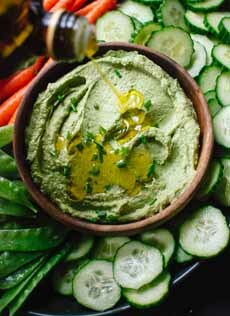 Green Goddess Hummus. Here’s the recipe from Cookie And Kate. 1. COMBINE the tahini and lemon juice in a food processor and whip for 90 seconds, pausing to scrape down the bowl as necessary. Add the olive oil, herbs, chopped garlic and salt and process for another minute, scraping down the bowl as needed. 2. ADD half of the chickpeas and process for another minute. Scrape down the bowl and add the remaining chickpeas. Process for 1-2 minutes, until the hummus is smooth. If it isn’t creamy enough for you, drizzle in 1 to 2 tablespoons water, with the motor running, until the hummus is the consistency you desire. 3. REFRIGERATE in an airtight container for up to one week. Top with the optional garnishes and serve.